Information modelling and knowledge bases have become ever more essential in recent years because of the need to handle and process the vast amounts of data which now form part of everyday life. The machine to machine communication of the Internet of Things (IoT), in particular, can generate unexpectedly large amounts of raw data. 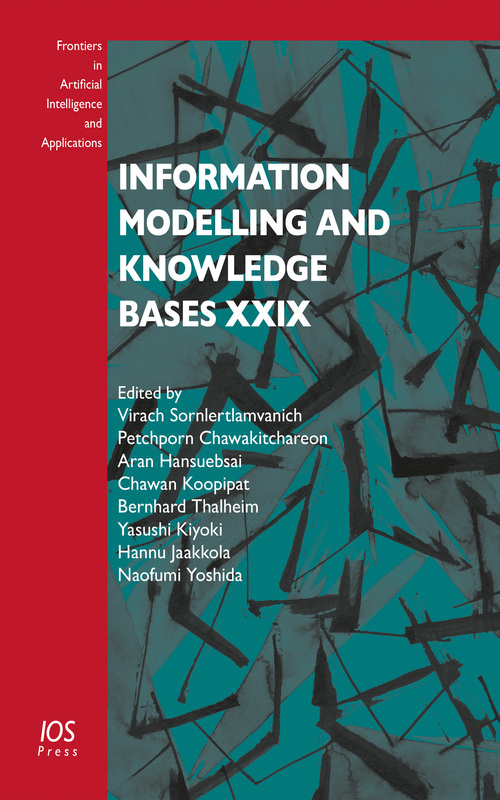 This book presents the proceedings of the 27th International Conference on Information Modelling and Knowledge Bases (EJC2017), held in Krabi, Thailand, in June 2017. The EJC conferences originally began in 1982 as a co-operative initiative between Japan and Finland, but have since become a world-wide research forum bringing together researchers and practitioners in information modelling and knowledge bases for the exchange of scientific results and achievements. Of the 42 papers submitted, 29 were selected for publication here, and these cover a wide range of information-modelling topics, including the theory of concepts, semantic computing, data mining, context-based information retrieval, ontological technology, image databases, temporal and spatial databases, document data management, software engineering, cross-cultural computing, environmental analysis, social networks, and WWW information. The book will be of interest to all those whose work involves dealing with large amounts of data.